This fabulous tin was offered at the 1939 World's Fair in New York as a souvenir container for 2-1/2 pounds of Loose-Wiles Biscuit Company's assorted biscuits. The top artistically depicts the towering Trylon, with the Statue of Liberty's eternal torch shining from the edge on each of its eight sides. 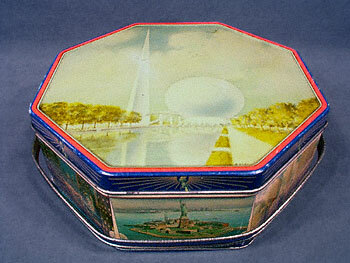 Each side of the tin features a different renowned landmark: The Statue of Liberty, Radio City, Times Square, Empire State Building, The Aquarium, The Skyline from Central Park, George Washington Bridge, and Grant's Tomb. Octagonal in shape, the handled tin measures nearly 9-1/2" side to side. There are a few scratches in the paint, as well as some wear to the edges, but it is in superb overall condition. The inside of this magnificent "Building the World of Tomorrow" keepsake is gold-tone and looks brand new.